All of our burgers are Premium Black Angus Steakburgers! To serve the finest quality food made fresh and made to order, in a fast, clean, and friendly atmosphere. This has been the mission of Spangles since they opened their first restaurant in 1978. Throughout the following years, Spangles developed into a muti-store success, becoming the Spangles Restaurants that everyone knows and loves today. There are twenty-seven Dine in and Drive thru locations in the Kansas area: 14 in Wichita, two in Hutchinson, one in El Dorado, two in Salina, one in Park City, 4 locations in Topeka, one in Andover, one in Derby, and one location in Emporia, Kansas. 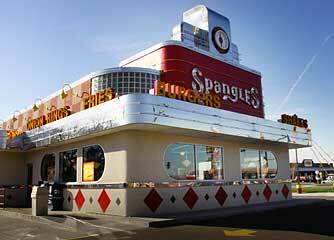 The early rock-and-roll décor, music and friendly atmosphere make dining at Spangles an enjoyable experience. From the low-fat Grilled Chicken on Pita, to Spangles’ exclusive 1/3 lb. Gourmet Supreme Steakburger, voted the best burger year after year. You’ll know you’ve made the correct choice when you choose Spangles!